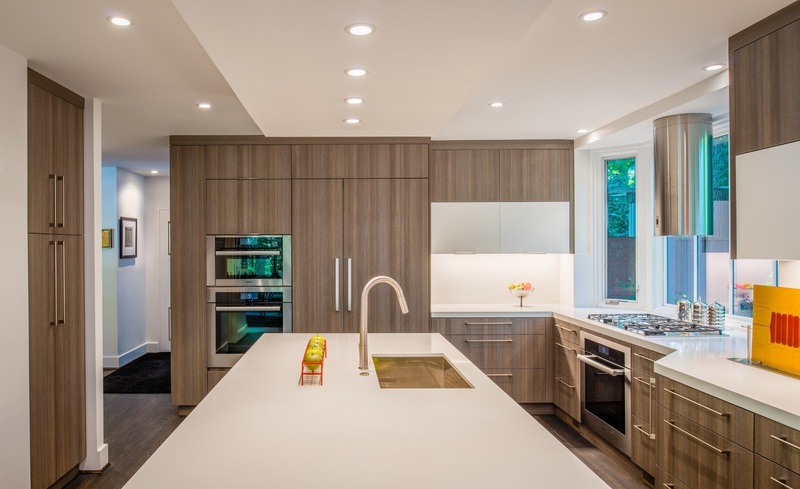 Many thanks to J.S Brown and Company, a custom remodeling company in Columbus, Ohio for sharing this transitional setting kitchen featuring our Tender by Faber. According to J.S Brown's marketing director Amber Durant, "This Kitchen remodel was part of a larger interior renovation to update a 1980's era contemporary-style home." The stainless appliances matched in this kitchen with dark woods, neutral counter tops and flooring allows for the appliances to jump out and create a design statement. 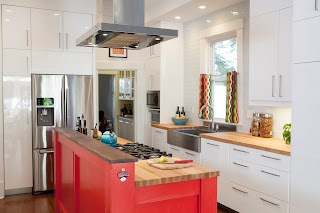 The subtle curves of the Tender make the hood a focal point in the kitchen and lend to the modern feel of the kitchen while still lending traditional elements. 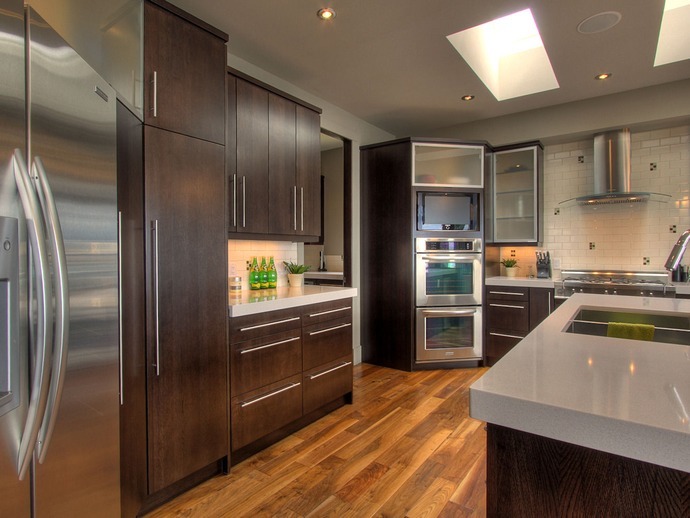 "I designed and built these cabinets for Scott Ross owner of Timberhaven Homes in Kelowna BC. Scott builds some of the most beautiful homes I've seen. I had done a number of cabinet packages for Scott, so I was honoured when he asked me to do his personal home. 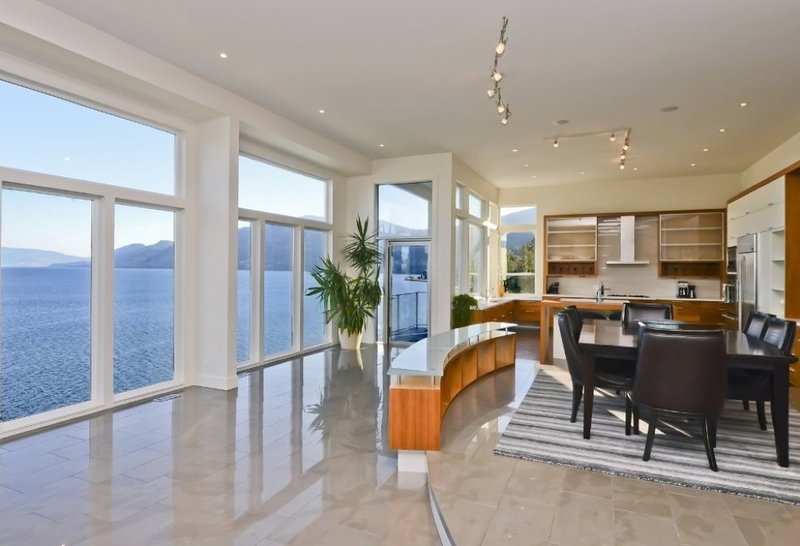 The house is situated in Vinyeard Estates near Mission Hill Winery overlooking Okanagan Lake and acres of vineyards! 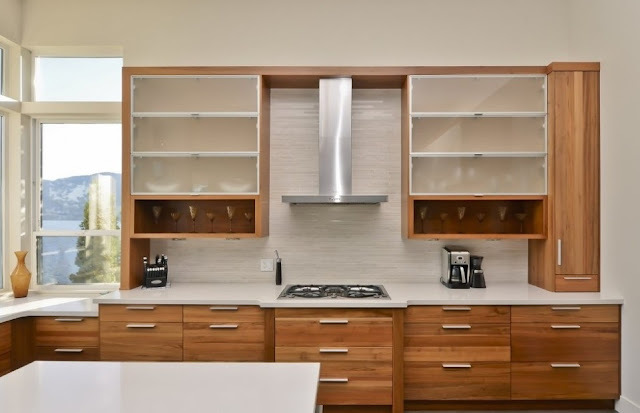 We used rift cut white oak with a dark walnut stain complimented with white quartz countertop, and glass and metal details. 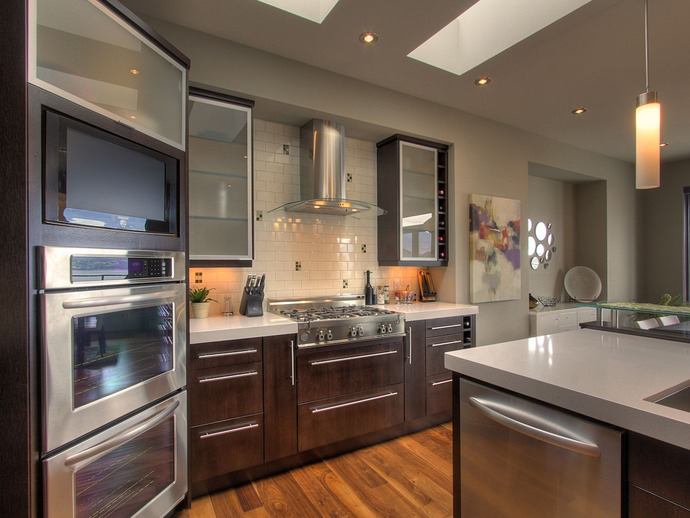 The kitchen was finished off with high quality appliances such as Faber's Tratto glass and stainless range hood to create a modern, timeless look that will always be in style." 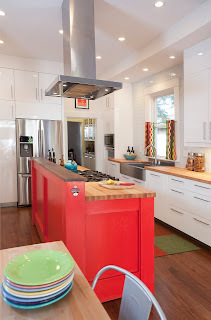 The Tratto hood blends in well into this well crafted kitchen. The glass shelving,white countertops and white tiles on the backsplash all compliment the minimal design of the Tratto. With 600 cfm's, stainless baffle filters, 2 level halogen lighting and electronic LED controls, the modern kitchen is enhanced by the hoods modern amenities. Thank you once again to Jason at Iron Wood Cabinet Company and to Scott Ross of Timberhaven Homes for sharing! Thank you to Anthony Wilder Design/Build, Inc. and Architect JP Ward, AIA for sharing these images of a stunning home in Maryland. The Cylindra Isola is featured above a Miele cook top and really highlights the functionality of an island hood that allows for being able to cook and see the incredible views into beautiful backyard at the same time! 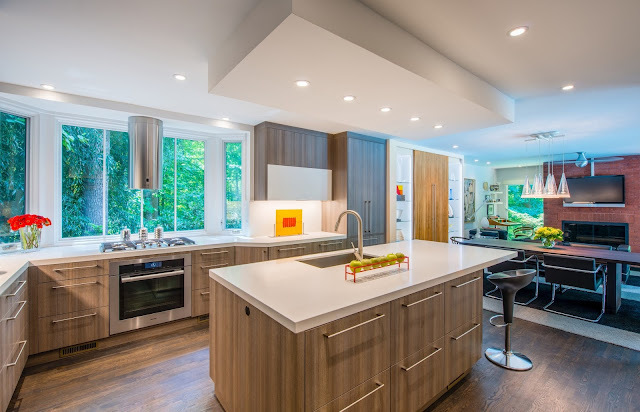 The natural elements of the kitchen, the neutral counter tops, the wood flooring and the light cabinetry all blend together to form an inviting setting which connects with nature outside thru the backyard facing windows. The Cylindra Isola hood becomes the focal point with it's stylish stainless cylinder hanging down from the ceiling. With 600 cfm's, advanced electronic controls and the stainless silent panel underneath and 2 level halogen lighting the Cylindra Isola has all the designer features you need. For more information on this hood and any others in the Faber line, please visit our website. Thank you to Joan Enger at J. Patryce Design , a New Jersey based Interior decoration firm for sharing this wonderful modern space featuring our Faber Maestrale hood above a Wolf range. 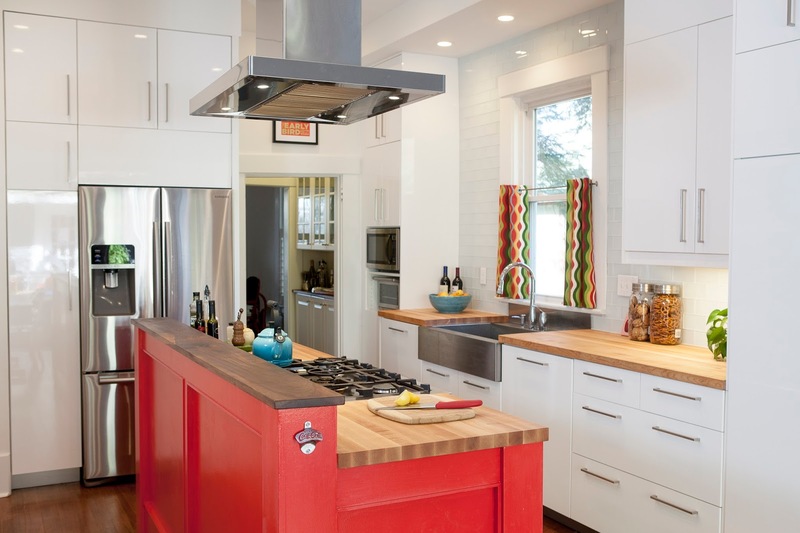 "The kitchen was created in a modern, clean fashion with a twist of classical. 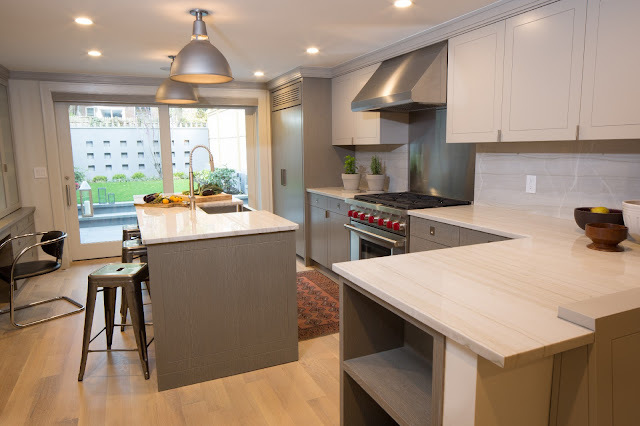 Instead of going with a traditional and expected shaker panel, we decided on a flat panel with a grooved detail to mimic the shaker style in an unexpected way. The base cabinetry was done in a custom cerused oak finish, while the upper cabinets were finished in a matte lacquer. The appliances were mostly concealed within integrated cabinetry panels, with the exception of the range and hood - allowing them to be the focal point of the kitchen. The Maestrale was a perfect fit with its clean lines and superior function. This is a great example of the "chameleon" hood Maestrale. Because this is a traditional Pro style hood, it fits into a traditional kitchen style. But looking at this example above, the Maestrale also works in a modern setting as well because of the clean lines and stylish curves on the nose. With 600 or 1200 cfm's, halogen lights, 3 speed control and the optional top or direct rear venting, the Maestrale provides an amazing value! With prices starting at a little over $1,000 USD, this professional hood that is 18" tall and 25" deep coming in 30 - 48" widths to match up with any pro-style range at a fraction of the price of the "named" range hoods. This means with no logo on the front of the hood, the Maestrale, again the "chameleon" hood, can blend with the branded range below and appears to be the same brand as the range but with a price tag in some cases $1,000 less! Todays beautiful kitchen featuring our Faber Classica hood comes courtesy of Nathan J. Reynolds of Insperiors, a Interior Design firm in Rhode Island who helps clients create their dream spaces in Massachusetts and Rhode Island. 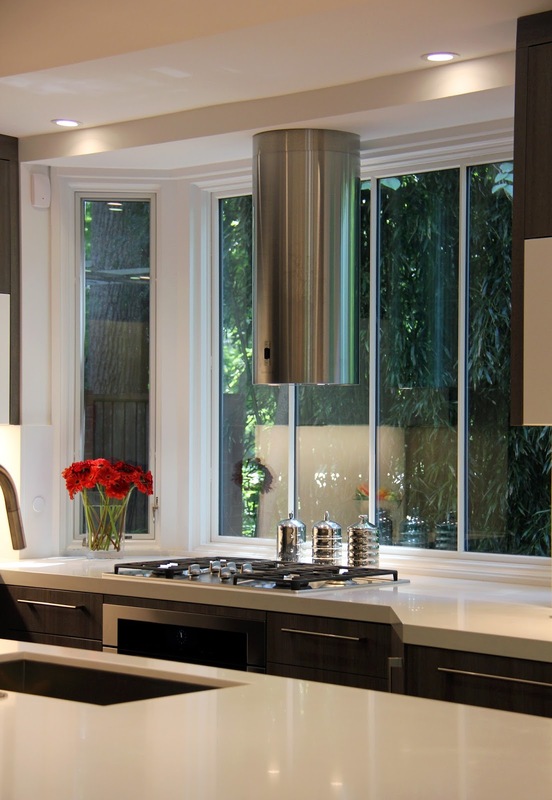 "The Classica stainless wall hood offers a high-end look to our North Dartmouth, Massachusetts kitchen design. 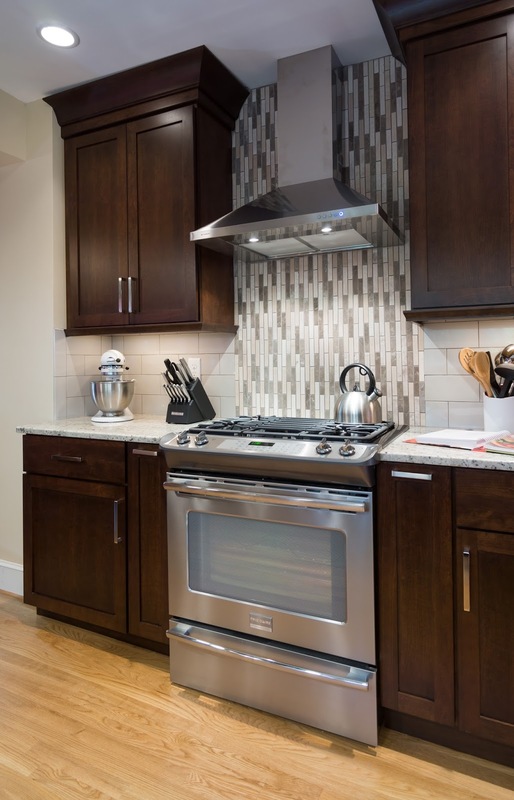 The chimney style range hood provided traditional design elements, solid performance and an overall great look above the Frigidaire gas slide-in range. 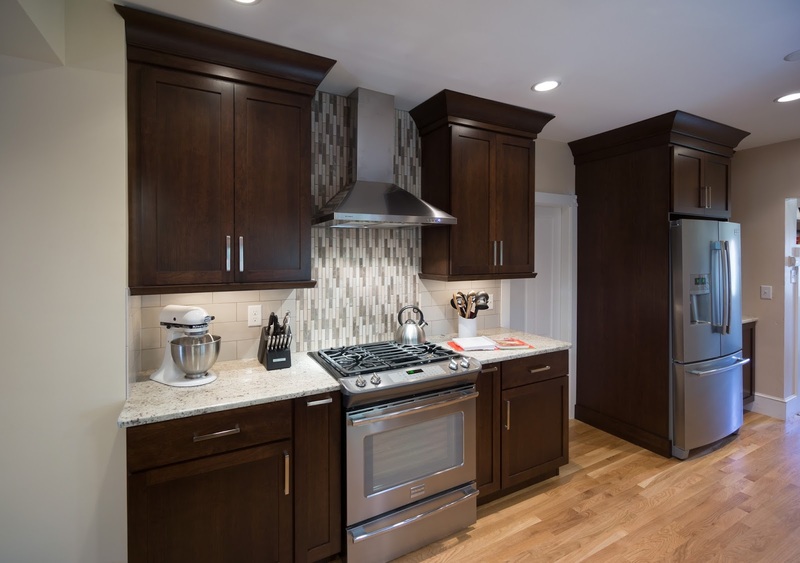 The marble stone tile behind the hood frames the look and creates a strong focal point in the kitchen—accentuating the high ceiling height and beautiful crown molding atop the rich cherry custom wall cabinets. The tiled backsplash takes this kitchen from plain to lovely and layered. 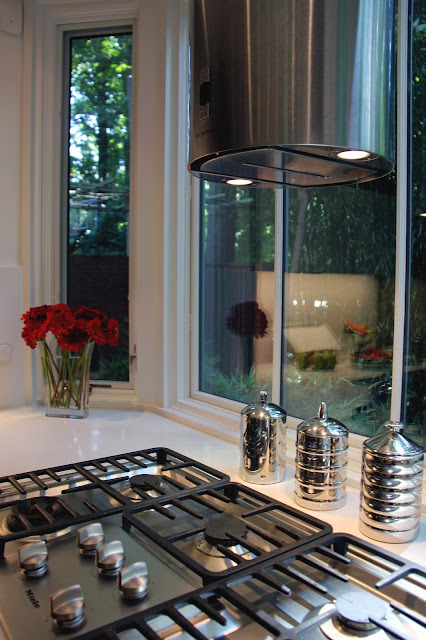 This kitchen really does accentuate the best qualities of the Italian styled Classica, the hood is a traditional shaped chimney style model but yet has modern design elements including the simple lines to fit into a transitional kitchen or a traditional one. With 600 cfm, dishwasher safe grease filters, a 3 speed LED electronic control and halogen lighting, the Classica has all the features and functionality you need in a decorative kitchen range hood. Visit Nathan's website for more information and to see his other Inspired Interiors and visit the Faber website for more information on the Classica and other models. Many thanks to designer and cabinet fabricator Jason Syberg of Iron Wood Cabinet Company who used our Stilo wall hood in this beautiful lakeside kitchen located in Peachland, BC Canada, in the Okanagan lake region. "I designed and built this cabinet package for my own house. I wanted to use natural elements, wood, glass, and metal and have them showcased against a white backdrop. I combined quarter sawn walnut, aluminum and frosted glass doors, paint grade millwork, white quartz countertops, and stainless steel appliances including a Faber Stilo hood fan to create a clean modern look that complemented the amazing lake view this property had." The Stilo because of it's sleek Italian design has always blended well in a contemporary setting. 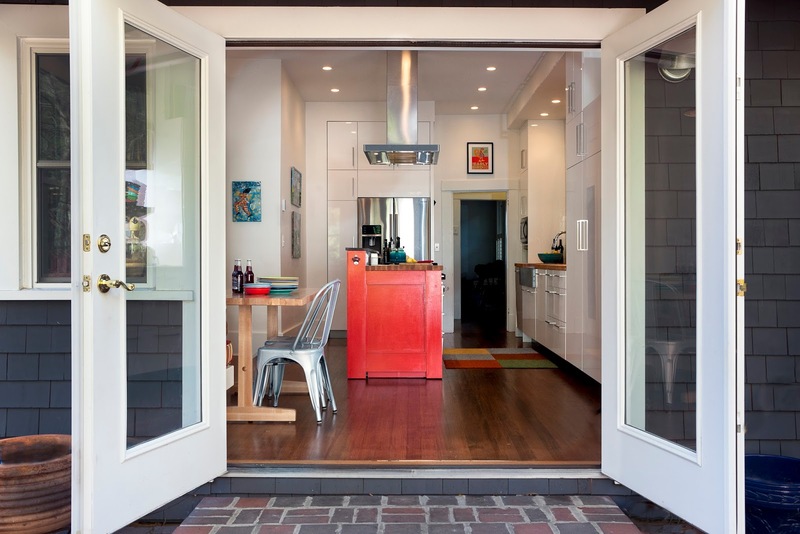 The hood compliments the entire kitchen and the clean lines of the hood match up with the horizontal lines of the cabinetry. And if Jason, a kitchen professional used our hood in his OWN HOME, that means he trusts Faber to be used by his clients! For more information see our website. Take a look at the Iron Wood Cabinet Company portfolio for more stunning designs. 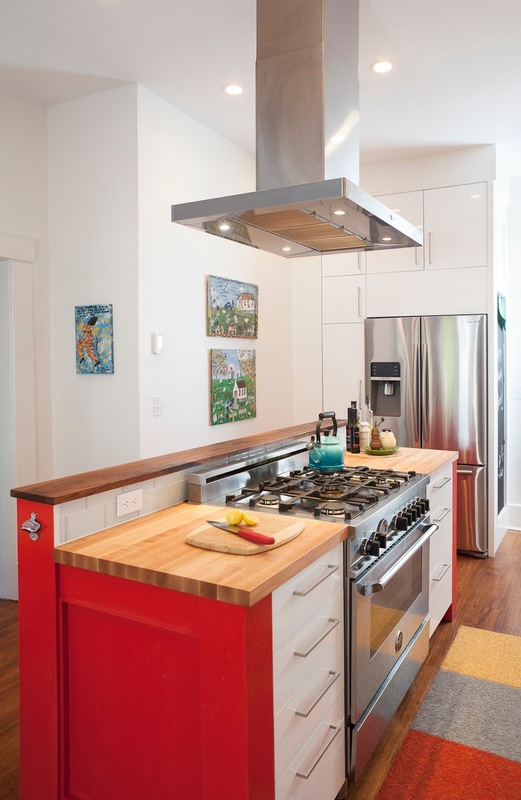 "The homeowners (who are avid cooks) picked the Faber hood because it had the correct capacity to pair with their gas range. We all liked the look of the hood (we were mixing traditional and contemporary in the space so it fit right in). The homeowners do a lot of research on which appliances are the best for busy kitchens, so the fact that they chose a faber means a lot!"